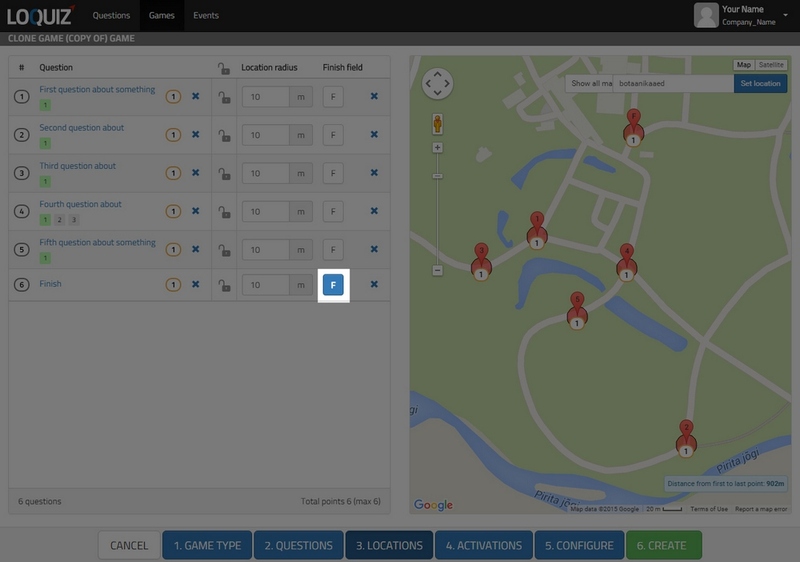 With Scavenger game type you can create a game that is simple and freeflow (meaning that all tasks are free to visit), but with starting field you can make teams follow different routes. Each team is assigned a personal starting point, and rest of the locations will become visible only after you have visited the first one. Click “New Game” and choose Scavenger game type. Add the tasks you want to use in the game. If you want you can add one special finish location, but you can also use any task instead of separate finish point. You can assign locations to the tasks on “Location” page.Make sure to mark one task as a finish location (push F sign behind the right task). Finish point acts differently from all the other tasks. It will not be visible on the map until the game time is over or all the tasks are answered or if an activation rule opens it. Also mentally mark down the tasks that you will use as starting fields. You do not have to have a separate starting field for each team, it is enough if you have some and they are in the different part of the city (or whatever area). You can do it on “Activation” screen. Do not set any activation rules. Just mark the starting fields as many you have teams (or less). Make sure not to mark finish as starting location, this will end the game before it even begins. In screenshot below I have marked tasks 1 and 2 as starting fields and task 6 as a finish. Do it on “Activation” screen. The one you need to tick is “Rotate start fields”. Then all the teams get one separate starting point, after answering it all the other locations become visible. If you do not tick it, all the teams will see all the start points set at the beginning of the game. Rest of the locations will become visible only after they have answered all those starting points. So make sure you tick this option. If you did everything correctly, then each team will see different starting point from your marked list of starting points (in our example 1st team to start will see 1st, 2nd number 2, 3rd number 1 in etc.) and after visiting the first task all the other tasks’ pins will appear on the map (also the starting points of other teams), but then teams are in different places physically already. Finish location will appear only after all locations have been answered or game time is over. In some cases you might want to set up the game so that each team gets separate and unique starting point that only opens for this team (e.g. it is the same task for everybody, but in different locations). To avoid this create the game exactly as explained above. 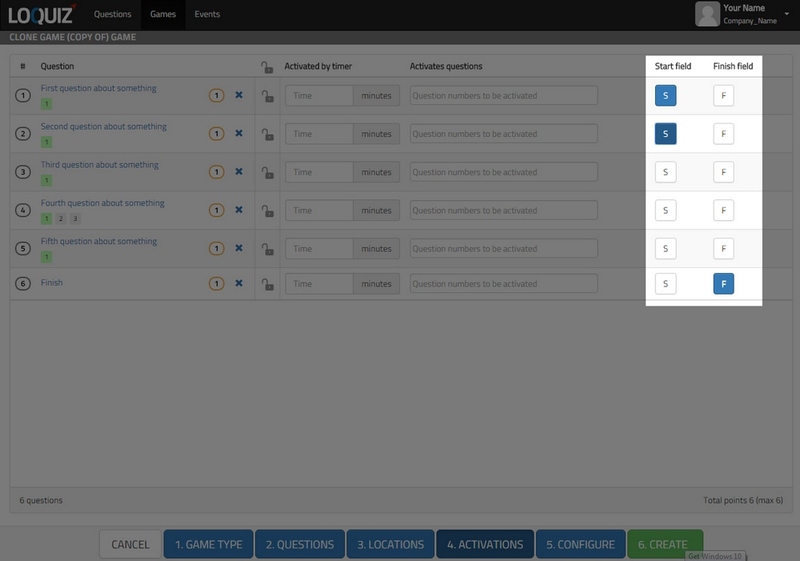 Then add activation rules to finish task, so that finish point activates all starting locations. In our example it would be that task 6 activates points 1 and 2. If you do so, other than one starting point will never be activated by finish, because by answering finish task the game ends. However because these tasks have rules, they will not be opened once starting field is answered, making it unique.